When a magician's trick goes horribly wrong, Jack and Phryne's inquiry reveals a past murder, but Phryne is distracted by an unexpected visitor. *Jack/Phryne remains at square one, with a potential romantic dinner interrupted by the arrival of Phryne's estranged father. *Hugh/Dottie remain at engagement status, with Hugh still uneasy with Dottie's assistance with/interference in investigations. *Dottie has learned how to lock-pick. *Jane is absent, and unmentioned, again. Ehhh, not thrilled with Jack's whining early on, but then I'm not a fan of any plot device that could be solved by two characters actually talking to each other for ten seconds. Jack and Phryne are adults, and have damn well earned some mutual trust and respect. So, yeah, the 'other man' turning out to be her father just irritated me. Not thrilled with the Hugh-Dottie dynamic. Hugh's continued belief that Dottie may somehow be convinced to be a stay-at-home wife makes him seem bit daft. Wow, that is a seriously thorough recap at the link. Ehhh, not thrilled with Jack's whining early on, but then I'm not a fan of any plot device that could be solved by two characters actually talking to each other for ten seconds. Jack and Phryne are adults, and have damn well earned some mutual trust and respect. It's been a challenge finding recaps while also trying to remain unspoiled for the rest of the season, if anyone finds another recapper/recap site please post it, it looked like the 'Fabulous Miss Fisher' blog peters out towards the end (but, I was scrolling down fast to avoid their finale post). 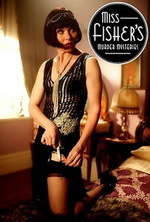 With so many new & returning network shows starting next week, I think I'll keep doing Miss Fisher posts on Saturdays instead of Tuesdays, unless someone else wants to take over. It's true, but I'm also watching The Knick right now, set only a couple of decades before, and the difference between women of that time and Miss Fisher is pretty striking. It was a time of huge change and it's understandable that Hugh doesn't quite get it. Dottie herself seemed a bit surprised when she initially realized she didn't want to give up her job, too. I think Hugh will come around in the end. I do feel like there's progress on the Jack/Phryne front. In the first half of the show she was an unrelenting flirt in their interaction while openly parading her other men around in front of him, but I feel like that's changing. She's starting to take him seriously. It's like Chekhov's Gun, but with costumes. If there's a dangerous thing that comes with a costume in Act I, Phryne will be wearing it in Act III. The racecar jumpsuit, the mermaid's cage, knife thrower's assistant, the fan dance... I'm sure I'm forgetting others. Also, they changed up the theme song to allow for more time for credits, which is cool, but they changed the theme song, which always weirds me out.